Today I want to talk to you about the mythology behind the Comic-con trailer of the Vikings. But first I would like to tell you what happened towards this blog. If you put the words world will tremble, Viking Mythology or Norse mythology you find an amazing lot of stuff. When I checked this out I was glad about the information I found but also sad. When I went deeper and deeper into the material I am going to explain in this blog I found out that season 5 could be the last season. I hope not but you never know. So our world could really be trembling if what I found out is the truth behind the trailer. I know I will take you to my perspective of the trailer and my opinions on what I found out but at least you know how I felt and maybe in a way you will find a way to explain it differently to me. Please feel free to contact me on what you think and feel free to get your own opinion. Right, back to what I wanted you to do and explain the mythology behind the trailer. The world will tremble but wasn't it already in season 4 episode 2 "Kill the Queen" by locking up Floki in the cave like the bounding saga from Loki. The screaming of Loki already shook up the world with earthquakes. We hear Floki scream but didn't see the earthquakes. We know that Ragnar couldn't kill Floki at that time so he freed him of his suffering by releasing him from the cave. In the first seconds of the trailer we see waving flag's this is a reference to Noatun the home of the god Njord owner of wind, sea, and fire. Here we see also a reference to Loki (Floki). There is also the myth about Baldr who is also a god of wind later in this blog I will tell you that it is most likely Baldr. If we look further into the trembling we find the story of Thor and Loki in Jotunheim. This story told by Harbard in season 2 and again told to Ubbe, Hitsverk, Sigurd and Ivar by Ragnar in season 3. We take the story in a wider perspective we see a similarity to Ivar because they use the same carriage wagon in the trailer. 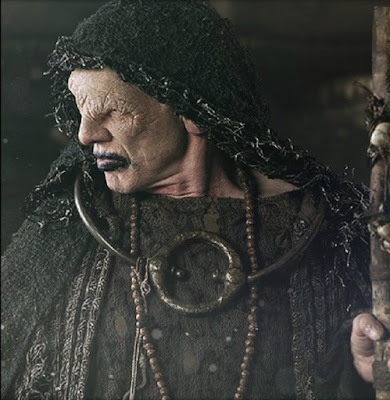 When the seer explains to Bjorn that the return of Ragnar will cause so many things like dead we see a boat lose its men and shipwreck this reference is Náströnd or better known Corpse shore we saw that also in the trailer of season 3 a beach full of corpses. The interesting part of the trailer would be the one with Aslaug and Lagertha and the sword. When I was looking for the sword I found some interesting stuff in the mythology of Aslaug when reading that mythology I found something interesting we haven't thought about it yet. Due to an article, I came across I was eager to find out if Aslaug only betrayed or plot against Ragnar. The only question is did she betray Ragnar with Yidu, but the truth of the matter is that it started back in season 2 episode 10 with King Horik. How you might wonder I will tell you. In the mythology of Aslaug, Aslaug wasn't called that way Kára because she was a slave before she met Ragnar. We also find her back as Sigrún in the mythology of Sigrún and Helgi I only wonder if this part played by Ragnar or Lagertha at that point. It is amazing to see this story about love and destroy. I think we see Gram in the trailer. Gram is given to Horik by Brunhilde, Brunhilde refers to the Sigurd story. When Ragnar kills Horik he became the owner of Gram but due to the absence of Ragnar after Paris, it is in possession by Aslaug. If it is in possession by Aslaug she could give it to Ivar by a crowning ceremony or Ivar will get it as it goes from father to son. If Ragnar won't kill her because of Yidu. We know from the trailer that it could be Lagertha killing Aslaug for what she had done to her so that could make Lagertha Helgi as well. On the other side, we also see a bleeding Lagertha in the trailer. That could also be a child that she carries and have a miscarriage. We see Ivar killing a few soldiers with a sword while lying on the ground. The sword could be Gram but more likely it is Tyrfing in the mythology of The lay of Grimnir. Grimnir another name for Odin. In the separation of Yggdrasil, we see an anger burst during Ragnarök. Will this stand for the revenge of Ragnar's sons, or will this anger burst stand for a lot of war's coming this season? Will they really succeed to fade away the world into their own? This is what scared me Ragnarök because this means that it could end because Ragnarök would mean the end of the world. It is also Baldr and Loki that are in the trailer and they are definitely represented in the Ragnarök story.